Ron Pearmine, Molly Pearmine McCargar, Ernie Pearmine and Molly's daughters L to R Lilly, Addy and Gracey. When faced with the decision “Go big or go home,” the Pearmine family usually chooses big. 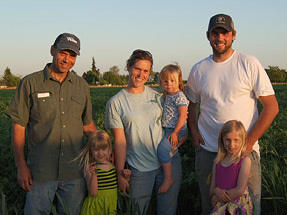 In 2009, their first year, they donated two acres of corn, an acre of green beans, and $5000 cash generated by their pumpkin patch to Farmers Ending Hunger. Pearmine Farms has been in the family since the 1950s. Brothers Larry and Ron manage the farm, along with Ron’s children, Ernie Pearmine and Molly McCargar, who will take over the operation as their father and uncle transition into retirement. The family farms just over 100 acres, more than half of which yields broccoli, corn, cauliflower and green beans that are processed locally at NorPac Foods, Inc. The remaining acreage is planted with sweet cherries, grass seed, wheat, an assortment of cereal grains, and a small amount of nursery stock. 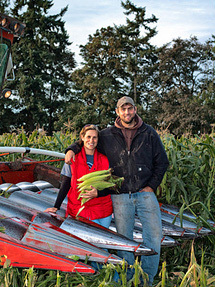 Molly Pearmine McCargar and brother Ernie Pearmine during corn harvest. They work their fields responsibly, using minimum or no-till methods that reduce soil erosion and require less equipment, saving time and money. 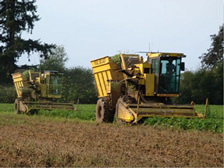 A GPS system facilitates precise steering and seed application. The Pearmines planted their first pumpkin patch with a corn maze right alongside it. They decided to collect cans for the Marion-Polk Food Share (check) rather than charge admission. The family continued to donate increasingly greater percentages of the proceeds from vegetable sales every year until they were donating everything. The pumpkin patch flourished as word of their generosity spread, bringing families, local groups, and children on field trips to visit. Harvesting Green Beans at Pearmine Farms.